Yesterday, I shared out a song that I written and recorded rather quickly on Sunday night. 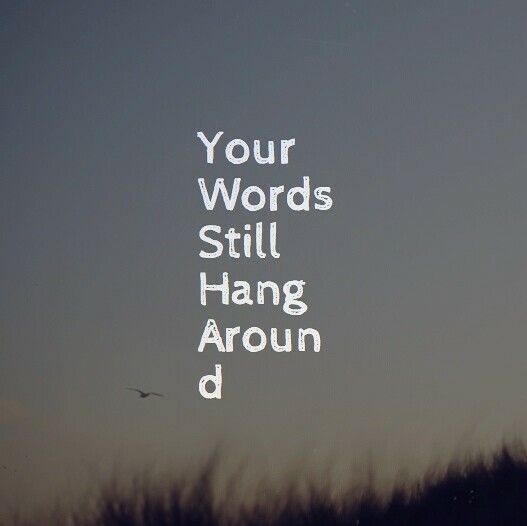 The song is called Your Words Still Hang Around. I like it well enough but don’t see it as something that fits well with my rock band, Duke Rushmore. After I shared the demo of the song, I asked my friend, Terry Elliott, if he might consider using the audio file in Soundcloud to create a Zeega digital story version of the song. Zeega allows you to layer in images, animated GIF files, and text, and the viewer decides on the pace of the digital viewing. 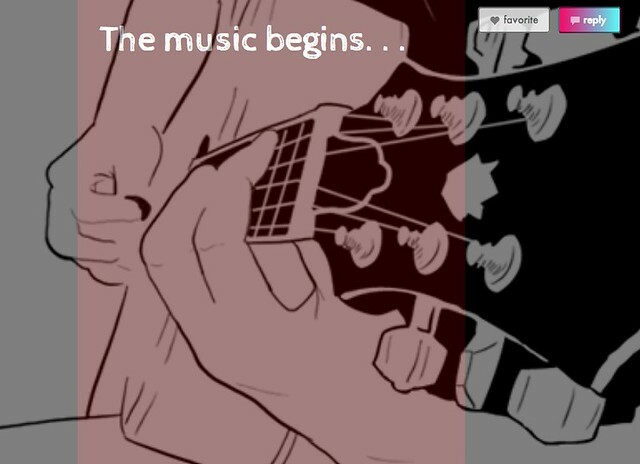 On Twitter, Scott Glass (a fellow musician and traveler in the CLMOOC) said he might give the song a try in Zeega, too. Both did, and I nearly cried watching both of their projects that used my demo song at the center. They hit the tone of the song just right, I thought, and it brought to mind the power of juxtaposition of image with sound. I find it so powerful when done right. And it’s not the individual media. Not the song itself. Not the images. Not the words on the screen. It’s the way those various parts come together to make the whole. If I had been the one constructing a digital story from my song, I think my role as the writer would have gotten in the way of the composition. I had the narrator (not me, by the way) in my head. I had the story I wanted tell, even as the song unfolded. I could see it as I sang it. Scott and Terry came at the song from another angle – tilted by our shared experiences in the Making Learning Connected MOOC which is now nearing its final reflective stage for the summer — and you get the sense that the song of loss and hope became more of a symbol of where we have been this summer with the CLMOOC and beyond, and the light of possibilities that still remain with all of our connections. Anyway, I am so grateful for both of them to take on this project and get it done and shared out in a single day. I’m listening again this morning, and I’m watching, and I’m learning more about the song than when I wrote and recorded it. I’m considering this song in a new light. Here is Terry’s version of Your Words Still Hang Around. Here is Scott’s version of Your Words Still Hang Around. This entry was posted in CLMOOC, Songwriting. Bookmark the permalink. The true power of friendship, collaboration, creativity… the works! The phrase “impossible thing” rises to the surface. I think collaboration over time, over distance, over serious topics and frivolous ones, they all contribute toward making this possible, but it is the attitude of acceptance and reciprocation that engenders this project. What if our classroom were more like this? Maybe yours is. Mine wants to be. There is so much learning here and even more unlearning. And mostly it is all a gift. All of it. The power of collaboration brings whatever we do to a higher level…. Kevin, your amazing talents give me a feeling that possibilities are unlimited. Congratulations on your new venture. And it’s not the individual media. Not the song itself. Not the images. Not the words on the screen. It’s the way those various parts come together to make the whole. This is exactly what I’ve been thinking about and what is the best way to help my students take all of these things into consideration when they are digitally composing. Your song is beautiful as are both of the Zeegas. It’s interesting that Scott and Terry came at the song differently than you had originally seen it. It just goes to show how collaboration brings us even more possibilities.